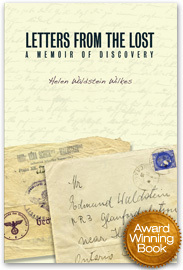 To download Chapter 1 of Letters from the Lost, and to learn more visit Helen’s website. 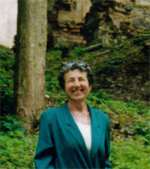 Margaret Atwood says “Written words are frozen voices that come to life when we read them.” Almost 15 years ago, I heard some frozen voices speaking to me from a box of letters that had lain on a shelf, unopened for almost 50 years. They were the voices of my Jewish family living in Europe during WW2. Circumstances that we now call “history” had torn us apart when I was very young. I grew up in Canada, on a farm in Ontario, where I never knew my aunts and uncles and cousins, and where I had not a single grandparent. I was 60 years old when I read the letters for the very first time. Through the letters, each family member sprang to life as an individual, and became a living, three-dimensional human. I could not ignore them. To simply close the box would be to silence these distinct, unique people for a second time, and, this time, probably forever. And so began an odyssey that has taken me on journeys to many places in Europe and in Canada. This odyssey has also taken me on a journey to my own Jewish identity, although as a child, my parents sent me to Sunday school in the United Church out of a fear that I would fall victim to the anti-Semitism that was then very much a part of Canada. In many ways, it feels like tonight, being here with all of you was my destination all along, but I didn’t know it. Tonight, really, is beyond my wildest imaginings. When I first read the letters from my family members, I imagined at best bringing them to life for scholars and possibly a few students of history in search of a dissertation topic. Scholarship and research were an important part of my life, and I set about working with the letters in a familiar way: decipher, translate, footnote. But for reasons I did not understand at the time, the process felt inadequate and unsatisfying. And thus, I found myself enrolling at Simon Fraser University in a course in writing creative non-fiction. I want to thank the instructor, Betsy Warland, and her students who listened to me read every week, most of the time barely concealing their boredom. Repeatedly, they told me that I must open myself to the reader and become the hook, for no one would otherwise be interested in a bunch of old letters. I followed their advice- but then I hit a new wall. Publishers from coast to coast thanked me for my interesting proposal, but regretted that the topic was “not their thing” – though they all wished me luck. Historians at the university tried to console me with tales of excellent manuscripts that would never be published. I feared that I had been unsuccessful in bringing those frozen voices to life, and was haunted by that failure. And then there was a SSHRC Conference at UBC and I decided to check out the book displays. I talked to a number of agents, but it was Athabasca University Press that expressed serious interest in my project. AU Press recognized the importance of letters and had begun a new series that seeks to capture the personal history of Canadians through diary, memoir and letters. Indeed, the series is entitled: Our Lives: Diary, Memoir and Letters. So, to Athabasca University Press, its staff and its Director, Walter Hildebrandt, I give my profound thanks. Your staff came up with the title. Your staff designed the cover, did the lay out and found space for more photos than I would ever have hoped to include. The graphic design and visual aspects have enriched my text and turned mere words into art. And now, your staff is helping me to bring my book to an ever wider readership. From the bottom of my heart, I thank you all. To the organizers and visionaries of the Alberta Readers Choice Award, I give my gratitude. Through this award process , you are giving much needed exposure to writers of non-fiction. By making the prize a significant amount of money, you lend importance to the genre and to the many excellent writers who choose this form of self expression. To my Champion Sharon Budnarchuk, of Audrey’s Books in Edmonton, who has spoken with great passion and sensitivity on behalf of Letters From The Lost, merci mille fois- and even 1000 thanks will not be enough. Here’s what Sharon said: This is an important book, a book we all need to read to remind ourselves that the victims of these kinds of horrors which continue today are made up of people like us: children, grandparents, brothers and sisters, cousins and friends, who all deserve better in the name of humanity. When I first learned what Sharon had said, tears came to my eyes. I knew she had heard the voices of my family and had deeply understood the book’s message. It is toward the goal of remembering those frozen voices that I wrote Letters From The Lost. It is toward the goal of ensuring a future for all who deserve better in the name of humanity that I dedicate this Alberta Readers Choice Award. For this opportunity and this privilege, I thank you.